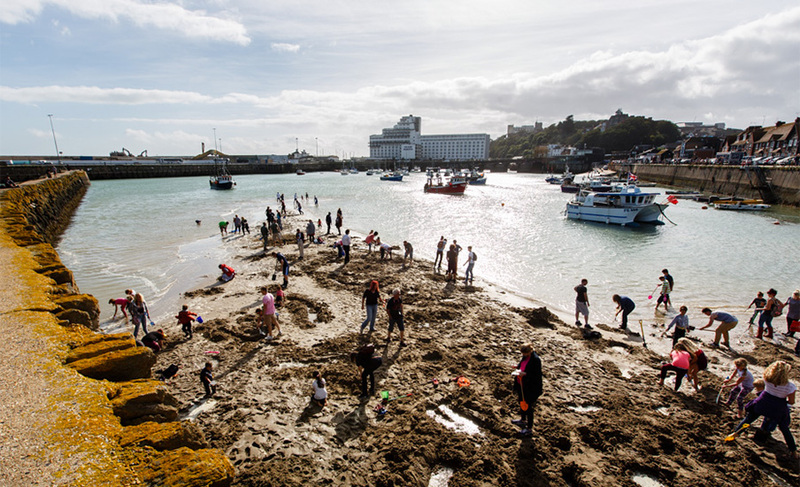 Folkestone Digs is Berlin-based artist Michael Sailstorfer’s contribution to Folkestone Triennial 2014 commissioned by Bristol-based art producers Situations. 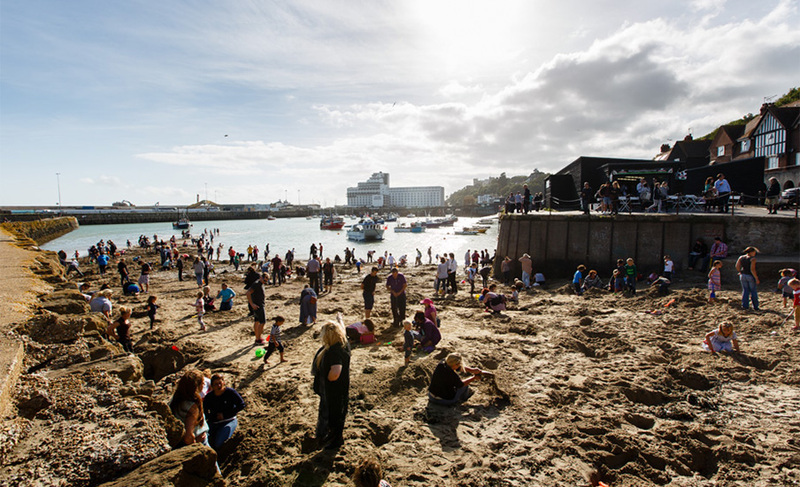 The project was developed in secrecy until the opening day, when it was announced that 30 individual pieces of 24-carat gold had been buried under the sand of the Outer Harbour beach. The beach, which is mostly under water at high tide, is open to the public. The pieces of gold are dispersed across a wide expanse of beach, which is revealed and accessible daily as the tide allows. Sailstorfer's sculpture is made and re-made daily by people digging on the beach. 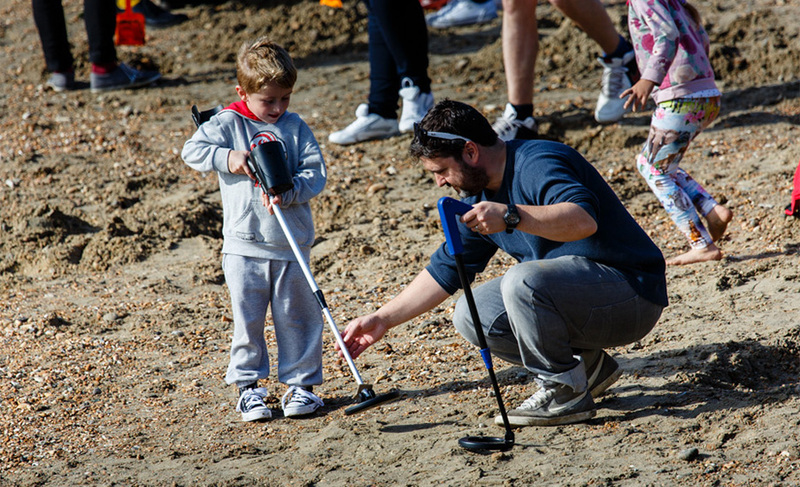 Since no-one knows how many of the gold pieces have been found, the goal of hidden treasure waiting to be discovered may be a permanent addition to the beach. Born in 1979, Michael Sailstorfer lives and works in Berlin. Though the artist’s artistic process spans highly elaborate productions to near-imperceptible interventions, a common factor across his work is the disruption of the everyday. Previous works have included painstakingly collecting fallen autumn leaves, painting and refastening them back onto the tree to simulate a premature spring. Another work enacts a process of ‘cabin cannibalism,’ with the artist feeding the rotting wooden walls of a small chalet to the wood-burner within, until nothing remains in the landscape but the burning stove. Sailstorfer is intent on expanding the notion of classical sculpture and Folkestone Digs is a continuation of his aim ‘to make art that comes less from the head and more from the stomach’.